Welcome to our collection of Math Puzzles for second grade. Here you will find our range of 2nd Grade Math Brain Teasers and Puzzles which will help your child apply and practice their Math skills to solve a range of challenges and number problems. Using puzzles is a great way to learn Math facts and develop mental calculation and thinking skills in a fun and easy way. Most children are much more engaged and motivated solving puzzles than working out pages of traditional math facts. Using these math puzzles below will help your child to develop their Math fact skills as well as their strategic thinking and reasoning. There are different versions of each puzzle from 1st to 5th grade, so it is easy to find an easier or harder version of the same puzzle. Each puzzle comes complete with answers. Here you will find a range of challenges and puzzles to develop your child's math skills and number facts in a fun way. These puzzles have been designed to support the 2nd grade skills of adding and subtracting. All the puzzles in this section support Elementary Math Benchmarks for 2nd Grade. Salamander Line-up involves placing salamanders on a square grid so that no salamander is in the same row or column as another salamander. It is a good puzzle for developing logical and reasoning skills. 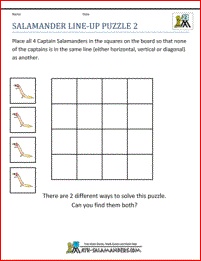 Captain's Square puzzle involves working out the totals of rows and columns made up of different salamanders. Each salamander has its own value. It is a good activity for adding together several small numbers, and it is very easy to extend by changing the values of the salamanders. Newton's crosses puzzle is a challenge which involves placing numbers in the correct place to get the same total in each row and column in the cross. It is a good activity for practicing addition facts. Quadra's Square Puzzle is a puzzle which involves placing digits in the correct places so that each row and column adds up to the same number. It is a good activity to use for practicing adding, and also to develop perseverance and reasoning. Magic Square Puzzle is a puzzle which involves placing digits in the correct places so that each row, column and diagonal adds up to the same number. 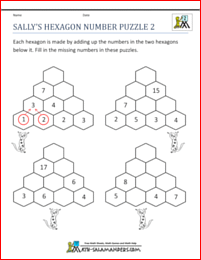 Sally's hexagon number puzzle is a challenge which involve accurate adding of two numbers together. Each number in the hexagon pyramid is made by adding up the 2 numbers below it. The Arithmogon triangle puzzle is a math puzzle to help develop adding and subtracting numbers and is also useful for developing logical thinking and pre-algebra skills at a higher level. The numbers in the two circles are added together to give the number in the linking rectangle. Puzzle 2b is a harder puzzle for more able mathematicians. Quadra's operation puzzle involves choosing the correct operations to make the math fact correct. It is a good activity for developing adding, subtracting and multiplication skills, and getting children to experiment with numbers and develop a number sense. 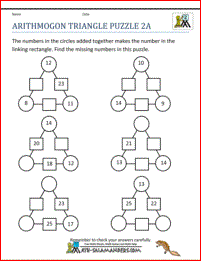 This adding puzzle involves using addition (and also subtraction facts) to work out the missing numbers on the trees. The aim of this grid puzzle is for you to find a path through the grid with a total of 25. Choose your path carefully! The maze involves adding a series of 5 to 6 numbers (with values up to 9) together to try to get a total of 25. This puzzle is all about finding pairs and set of 3 numbers that add up to 30. The aim of this puzzle is for you to finish the maze with a total of 20. Choose your path carefully! The maze involves adding, subtracting and multiplying by 2. Looking for an easier puzzle...? If these Math Puzzles are not at the right level for you, try some of our easier 1st grade math puzzles. Looking for a harder puzzle...? If these Math Puzzles are not at the right level for you, try some of our harder 3rd grade math puzzles. 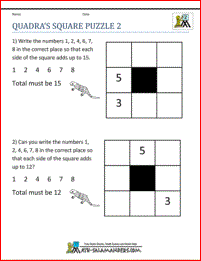 Looking for more 2nd grade Math Puzzles...? 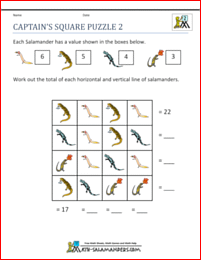 Why not take a look at the math puzzles at the 2nd Grade Math Salamanders? There are a wider selection of puzzles specially designed just for 2nd graders. Using the link below will open the 2nd Grade Math Salamanders website in a new window. Number Search Puzzles are a great way to get children looking for numbers and developing number recognition skills. They are also a good resource for developing short term number memory skills, and can be a good way to take the fear out of large numbers. We have a range of different number search puzzles - from easier puzzles to trickier ones to work out. With the easier puzzles, the numbers only go horizontally (left to right) or vertically downwards. The numbers get progressively larger on the trickier puzzles, and the grids get larger. 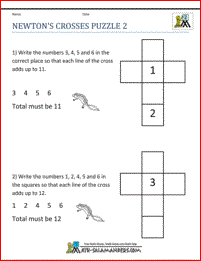 Here you will find a range of free printable Second Grade Math games. All children like to play Math games, and you will find a good range of 2nd Grade Math Games here for your child to play and enjoy. The following games involve different Second Grade Math activities which you and your child can enjoy together. 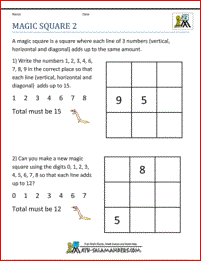 We have a range of magic square puzzles for kids to solve, suitable from 1st grade and upwards. Most of the sheets involve finding the missing numbers to create a magic square. Here is our collection of free math riddles from 1st grade to 5th grade. You will find a range of number riddles which will help your child to develop their place value skills, as well as developing their problem solving and reasoning. 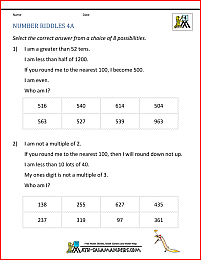 The riddles are also useful for developing understanding of mathematical language.